So many times in this column we mention players for their on field achievements. We’re gonna start this one with someone for whom making it back on to the field is one in of itself. Yeray Alvarez was diagnosed with testicular cancer not two months ago. Not that such a horrific disease pays attention to these kind of things but the lad is only 22. 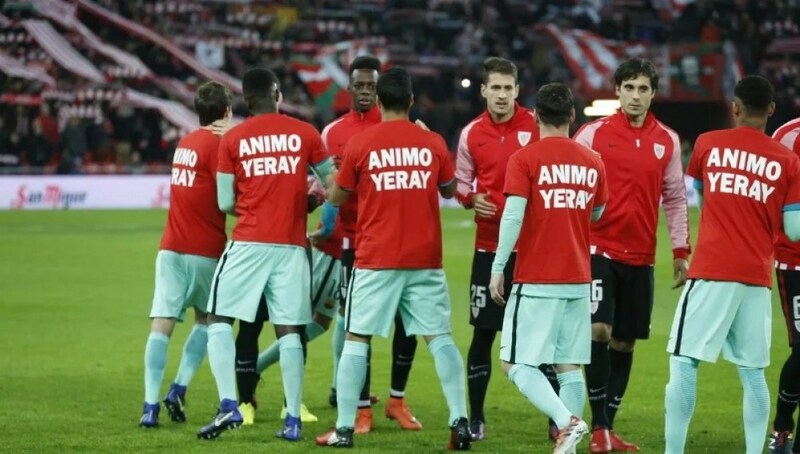 In fact, it robbed him of the chance to play against Barcelona last month in the Copa Del Rey, prompting both teams to wear t-shirts as a sign of solidarity. So it was great to see him back in the line up for Athletic Bilbao yesterday against the Catalan giants. Barca may have won the game but there are some things more important than football and kicking cancer in the balls (quite literally) is one of them. As for what happened on the pitch; Napoli quite clearly were upset with the fact that two Finnish clubs were in consideration for the award two days running and that one of them scored seven. They reigned down hellfire upon Bologna, beating them in their own backyward by a whopping 7-1 scoreline. Dries Mertens clearly wanted to be the first two time award winner as both he and Marek Hamsik bagged hat tricks each. Lorenzo Insigne having to suffer the relative indignity of only getting one goal. While we’re massively impressed with your efforts to impress us Napoli, we’re going to have to give this one a pass. With the way Mertens is assisting goals lately, we think he’d understand. In the motherland, we would be hard pressed not to address Eden Hazard’s wondergoal (which had Arsenal fans saying the word mother[something else entirely]. One goal alone isn’t enough to win you this award in the days of double hattrick Napoli but if it were, this is a damn fine effort. Benfica have been in freefall lately. By which we mean they’ve lost two games in the last week or so. None of that matters however if their rivals don’t take advantage. Here’s Porto’s Tiquinho scoring twice to win the game against Sporting Lisbon and do such that. How do Porto keep doing it by the way? Not just by finding good players, but players with such great names! Okay so we tried to swerve you by going elsewhere first but there really isn’t any doubt that today’s award has to go to a Premier League player with a much better record than you’d ever think. He’s also a good ten years younger than you’d ever think too, given how long he’s been around. Romelu Lukaku. Am sure that’s Mayan for “he of many goals in many games, but not as prolific as that record would suggest”. His four goals against Bournemouth broke records, so it’s only fair that he break the record of “first Everton player we’re ever going to acknowledge might not be terrible”. We fully expect a DVD and parade from Everton fans sometime very soon. Especially if they’re going to keep improving while their cross city rivals keep doing whatever the hell that is. Eddie Howe and his men were at a complete loss as to how to stop Lukaku but they never even tried getting him to put on a Belgium shirt. Works for everyone else.